What was the ECB’s decision? Once a month members of the European Central Bank (ECB) huddle up to set the interest rates that they would implement for their programs. Last Thursday the ECB revealed that for the month of May its refinancing rate (the rate European banks pay the ECB when borrowing money) would be cut from 0.75% to 0.50%. Meanwhile, its deposit rate (the rate banks pay the ECB to store their money) would be kept at 0.0%. Why did the ECB cut its refinancing rates? Last month the ECB kept its rates steady at 0.75%, but they had also said that they were willing to do more in case economic conditions deteriorate in the region. Unfortunately, deterioration was exactly what happened since then. Not only did we see weak consumer and investor confidence, but manufacturing PMIs in key regions had also declined while unemployment rates continued to skyrocket. What’s worse though, is that troubled economies like Greece and Spain don’t seem to be any closer to economic recovery than they were a couple of months ago. What’s worrying ECB head Mario Draghi and his team is that weak growth in peripheral countries is now spreading to its core economies like Germany. And with price pressures in the region staying within expectations, the ECB had little excuse but to step up its game. 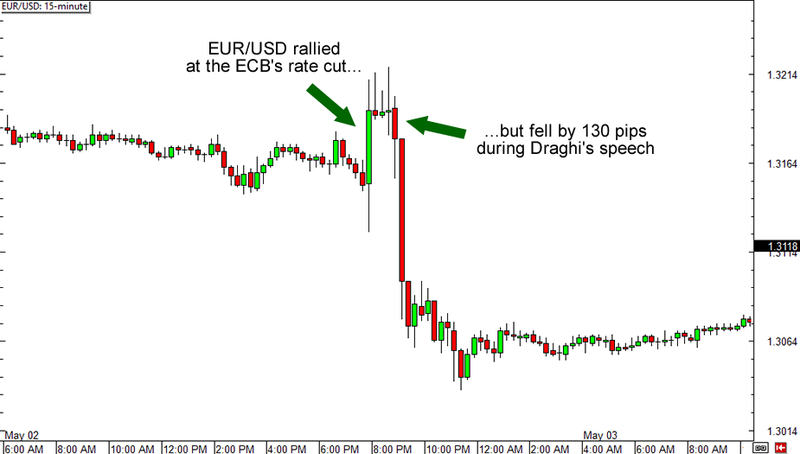 Earlier speculation of an interest rate cut had dampened EUR/USD’s initial reaction when the ECB announced its decision. What’s more interesting is how the pair reacted a couple of minutes later when Mario Draghi took center stage. EUR/USD wiped out its 41-pip initial uptick and dropped by a ridiculous 130 pips in 30 minutes! What the heck did Draghi say?! Among other things, Super Mario nixed talks of ending austerity measures in countries that are doing relatively well against other euro zone nations. Instead of hinting at less austerity measures, he cautioned governments not to “unravel the progress” that they have already achieved. If you remember, having negative deposit rates would mean that banks would have to pay the ECB to store their money. This could not only limit credit supply for bank borrowers, but it would also force banks to reallocate capital elsewhere, like lending to a wider market as the ECB would intend. So is the ECB just warming up on its stimulus programs? Many analysts think so. In fact, some are already speculating that other measures like buying corporate and longer-term bonds will soon be on the table as well. Still, it will probably take a couple of months and lots of weak economic data before the ECB seriously considers using other stimulus options. But that’s just me. What do you think? Is the ECB just warming up or is it using its last tools when it cut its rates last Thursday? Will the ECB implement NEGATIVE deposit rates this year?